. @FoxTV earned 4.18 million viewers for Sunday's #AutoClub400 @ACSupdates, up 4% from 4.03 million for last year's race. However, there are still considerable caveats to consider here. For one, while the trend of increases is positive, a four percent rise isn’t huge, especially considering just how bad the early-season ratings were in 2018 (the viewership for Fox’s half of the 2018 season was down 19 percent from 2017, 29 percent from 2016). 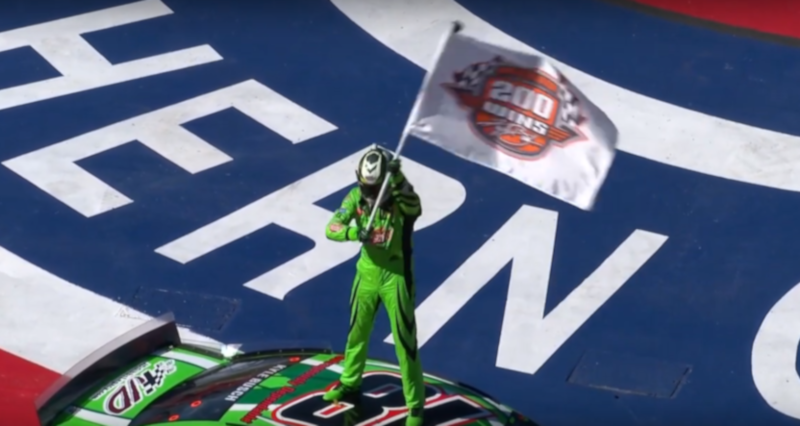 For another, Sunday’s race may have had more interest than normal thanks to Kyle Busch going for (and eventually getting) his 200th win across NASCAR’s national series (he didn’t quite get there in the Xfinity Series race Saturday, despite what an AP alert said); that’s not something you can replicate week-to-week, although there will be interest in seeing when he gets #201 (passing Richard Petty’s record; however, Petty’s wins were all recorded at NASCAR’s top level, unlike Busch’s, and in a much different era, so the records aren’t easily comparable). Beyond that, there are some other elements that illustrate NASCAR still has ratings challenges. As per Mitch Metcalf’s ShowBuzz Daily breakdown of sports ratings this week, the Auto Club 400 averaged 4.178 million viewers 2+. That put it behind two other sports events Sunday, the NCAA Tournament selection show (6.21 million viewers on CBS) and the PGA Players’ Championship (4.191 million viewers on NBC). And it barely beat ESPN’s ACC Tournament games Friday and Saturday night (Duke/North Carolina and Florida State/Duke respectively), which pulled in 4.15 and 4.06 million viewers respectively. As a broadcast network, Fox has much wider distribution than cable network ESPN (per the latest Nielsen coverage estimates, ESPN is in 85.9 million U.S. households, so given the estimated U.S. TV universe of 119.9 million homes for this season, Fox has a more than 30 million household advantage), so barely edging cable college basketball seems not ideal. Another significant issue comes from the demographics. This isn’t new, as the aging audience for NASCAR and some other sports has long been discussed; a 2017 Sports Business Journal story found that NASCAR had the third-oldest audience in 2016 by average age of TV viewers (58, behind only golf and men’s tennis), and the worst change in average age since 2006 (+9). But the aging audience continues to be an issue, especially as a lot of advertisers are concerned with the 18-49 demographic. And by that metric, NASCAR’s ratings this weekend aren’t great; they averaged 932,000 viewers 18-49, ahead of golf, but behind five different college basketball games (UNC-Duke led the way with 1.98 million viewers 18-49) and one NBA game (Golden State-Houston on ESPN Wednesday). All in all, it’s still good for NASCAR to post some ratings growth. But that growth should be considered in context; it’s year-over-year growth coming off an absolutely terrible year, and it’s not enough growth to thrust NASCAR back to where it once was, especially if you look at the age demographics. A year-over-year rise is nice, and it’s promising that they’ve recorded three straight weeks of growth. But it doesn’t exactly mean that the ratings concerns with the sport have vanished.